A man who murdered a coin enthusiast over a collection which included limited edition Beatrix Potter 50p pieces has been jailed for life. 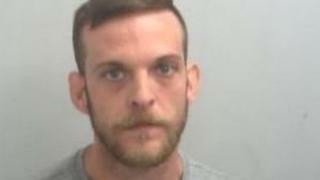 Danny Bostock, 33, stabbed Gordon McGhee, 52, at his Colchester home in August and then attempted to set fire to the property to cover his tracks. A large quantity of Mr McGhee's collection has never been recovered. Bostock, of Baberis Walk, was found guilty of murder and attempted reckless arson and must serve at least 30 years. Mr McGhee had previously shown fellow enthusiast Bostock the collection and he had been "amazed", Ipswich Crown Court heard. Image caption Gordon McGhee was a coin collector who his family described as "loyal, generous, empathetic and witty"
Judge David Goodin told Bostock that Mr McGhee had given him a number of duplicates "in recognition of your own interest in that area so you could have it for your own collection". "When he did that, sparking your immediate and keen interest, he sowed the seeds of his own destruction at your hands," Judge Goodin said. "You decided you could have that collection then in the early hours... you went after it." Bostock entered Mr McGhee's unlocked flat in Forest Road, Colchester, in a bid to steal the coins, but when the victim awoke the defendant stabbed him at least 14 times. He then "placed the lives of neighbours at grave risk" when he tried to blow up the flat, leaving a gas cooker on and a half burnt dishcloth nearby, which police said had Bostock's DNA on. His DNA was also found on a ripped package used to store the coins. Mr McGhee was found dead on his bedroom floor on 22 August. Prosecutor Andrew Jackson told the court the coins were "precious heirlooms" that had been due to be passed down to Toni Smith, whom Mr McGhee regarded as his daughter. He said the theft of the collection had, therefore, "added to (the) heartbreak" for Ms Smith and her mother. In mitigation, Alison Levitt QC, said the murder was not pre-meditated but happened "when something went terribly wrong during the course of this burglary". She said that he had not gone to the property armed with a knife. Judge Goodin said: "This was a murder done for gain."